The harvest is in, and the artisans are preparing for the upcoming festival. The game of Lanterns is one of those games that looks relatively simple but turns out to be amazingly tactical. The objective is to score the most points. The method to get points is to collect lantern cards in one of 3 configurations: 4 of 1 color, 3 pairs of different colors, or 1 of each of all 7 colors. Players gain lantern cards by laying a lake tile per turn adjacent to an existing lake tile in the central play area. 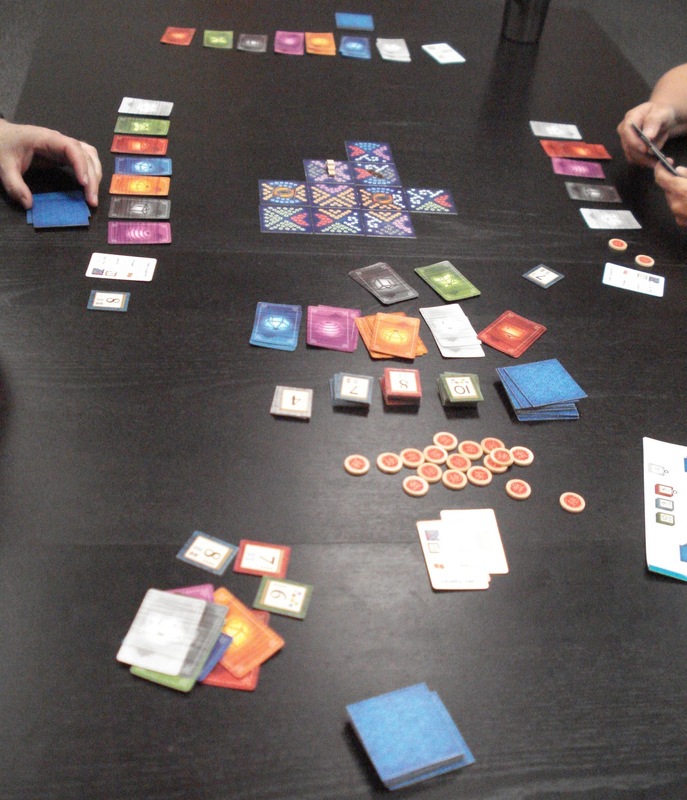 When a lake tile is placed, each player will receive the color lantern card that corresponds to the color on the tile side facing them. In addition, the player who placed the lake tile will get an additional lantern card if they place their tile so that the color on the side of the tile being placed matches the color on the adjacent tile(s). Everyone’s lantern cards are played face up in front of them so you can see what sets everyone is close to completing. The key to success is to get sets before anyone else as there is a descending point value on each of the sets. The first set of 7 different colors turned in gets 10 points, the second set of 7 earns 9 points, etc. The top score value for 3 pairs is 9 points and for a 4-of-a-kind set the points start at 8 points. Again as with the 7 of each color set, the next sets of 3 pairs and 4-of-a-kind are worth fewer points. So how do you place a tile that gets you the cards you need without giving your opponents the card they need? The game plays quickly and keeps everyone’s head in the game. You are always gaining new cards and new insights to what others are getting close to scoring. Players have in their 3 lake tiles from which to choose from on each turn. They must choose wisely which lake tile to play and how to orient the colors to win at Lanterns. 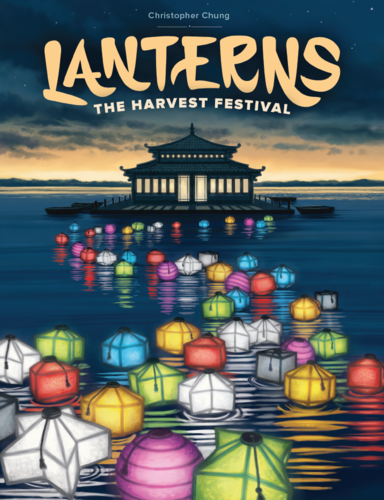 We have an open copy of Lanterns available in our Demo Games Library for you come in and try.